Learn to bind your own book! 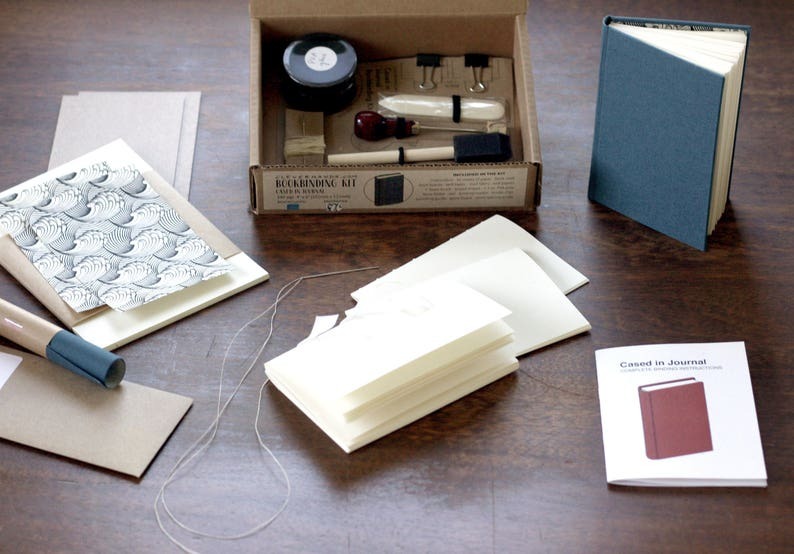 This complete bookbinding kit has the tools, supplies and instructions to make one cased in hard bound journal. This kit will teach you to make an A6 (4"x6") classic hard cover book with 140 pages. The comprehensive tools and instructions make this kit the perfect gift - a gift that keeps on giving. Use the kit and included supplies to make your first book, then you'll have the tools and skills to make more. The instructions include links to bookbinding suppliers, or you can order a refill for the kit from cleverhands.net! PVA glue is sensitive to temperature. If it is stored below freezing it will loose its adhesion. The texture of the glue should resemble Elmer's glue. If it has thickened to a paste like consistency or become clumpy or sandy it may have been exposed to low temperatures for too long. If you have concerns about freezing temperatures please contact me via convo. Questions? Send me a convo! This kit is all inclusive of what you need to make a book. The instructions are clear and easy to follow and my book turned out very well. Quick shipping, and item as described, Thanks.